Do you know someone who makes an outstanding contribution to the arts in BC? 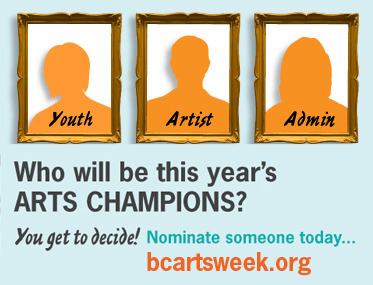 Nominate them for a BC Arts Champion Award! Now in its 14th year, BC Arts and Culture Week highlights the vital contribution that arts and culture make in learning and in life. As part of the BC Arts and Culture Week events happening around the province, individuals making significant contributions to the arts in BC are honoured through the BC Arts Champion Awards. Nominations are now being accepted for the BC Arts Champion Awards. Nominations must be received by Friday, March 8, 2013. Three awards will be made to an artist, administrator and youth making significant contributions to arts and culture in BC. This year, award winners will each receive original commissioned artwork created by three BC artists.